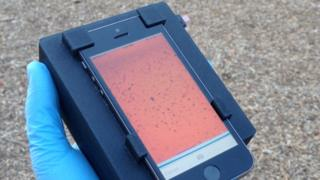 A smartphone has been used to automatically detect wriggling parasites in blood samples. Previous efforts to eradicate two parasitic diseases - river blindness and elephantiasis - have been suspended because the treatment can become fatal in some people. One treatment, the drug ivermectin, is risky in people with high levels of Loa loa worm - the one that can crawl across the surface of the eye - so people need to be screened first. However, testing is time-consuming and requires laboratory equipment. "With one touch of the screen, the device moves the sample, captures video and automatically analyses the images," said one of the researchers, Prof Daniel Fletcher.